Choose/Roll for Warlord Traits. Each Player or 1,000pt list gets a Warlord and a Warlord Trait. Determine Deployment: Both teams roll off, rerolling any ties. The winner rolls a single die to determine the deployment type (p.216-217). Once the map is determined, the loser of the roll off chooses his/her deployment zone. Alternate deployment with each team placing a single unit at a time (not each player), starting with the team who did not choose their deployment zone. After both teamss have finished deploying their army, roll to determine first turn. The team who finished deploying first receives a +1 to this roll. The team that wins the roll can choose to go first or second. The team that is chosen to go second may attempt to seize the initiative. Each 1,000pt list (normally a single player) is considered a separate army. Each 1,000pt list gets its own Warlord, Warlord Traits, Command Points, etc. Abilities that would normally only affect models in a player’s own army cannot be used on their partner’s models (auras, psychic powers, stratagems, etc.) even if they share keywords. Psychic abilities, army specific abilities, and Stratagems are limited by PLAYER not by team. Command Points may not be shared and should be tracked separately by player. Your partner’s models do not count as enemy models (and should not be considered for example when considering the smite psychic power or targeting an enemy character). All objectives will be scored as a team. Battle Length: At the end of game turn 5, the player who went first must roll a D6. On a roll of a 3+ the game continues, otherwise, the game ends. At the end of game turn 6, the player who went second rolls a D6. On a roll of a 4+ the game continues, otherwise, the game ends. The game ends automatically at the end of the 7th game turn. Updated Sudden Death: If, at the end of any turn after the first full game turn, a TEAM has no models on the table, a judge should be called. Note, Flyers do not count towards models on the table per GW FAQ. The player with models remaining must play out the remainder of the game including rolls to see if the game continues at the end of game turns 5 and 6. Forfeit: A team who gives up, refuses to/is unable to play out a match to its conclusion, or otherwise forfeits receives no points they may have earned during the match. If this occurs, call a judge immediately. The remaining player will act as though a “Sudden Death” has occurred. Rerolls before the first Battle Round: Players may only use the “Command Reroll” Stratagem once before the first Battle Round. EXAMPLE: A player loses the roll off to determine who goes first. That player chooses to reroll their die and still loses. That player may not later reroll their Seize the Initiative roll because they have already used the “Command Reroll” Stratagem this phase. First Blood: A team earns 2 VP if the first time they completely destroy an opponent’s unit. IF the opponent completely destroys a unit in the same GAME turn, each team instead earns 1 VP. Warlord: A team earns 1 VP for each opposing warlord that is slain at the end of the game. NOTE: Each mission has ONE Primary and TWO Secondary Objectives. All THREE add up to the final game score (along with Tertiary Objectives). MAX points each round is 25 points. 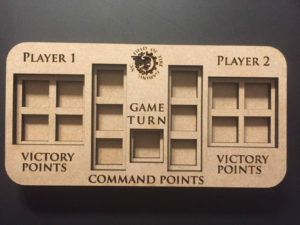 Secondary: Control the Field – Starting on the second GAME turn, a team scores 1 VP if they control more objectives than their opponent at the beginning of their turn. The maximum points for this objective is 5 VPs. Keep track of this throughout the game. Secondary: Take and Hold – Each Objective is worth 1 VP to the controlling player at the end of the game. Secondary: The Relic – At the end of the game the Relic a player who is carrying the Relic scores (5-0 VPs). If no player carries the Relic then treat it as an objective. The player with more models within 3” of the Relic at the end of the games scores (4-1 VPs). If no models are within 3” of the relic the player with a model closest to the Relic scores (3-2 VPs). Secondary: The Relic – Starting on the second GAME turn, a player scores 1 VP if they are carrying the relic or, if no model holds the relic at the beginning of that player’s turn, that player has more models within 3” of the relic. The maximum points for this objective is 5 VPs. Keep track of this throughout the game.